I am calling to ask you to do everything you can to cut US financing of the brutal Honduran regime, which is murdering pro-democracy protesters and targeting journalists and human rights leaders. Over 30 people have been murdered, many of whom were killed when the Military Police fired live bullets at protesters, and hundreds of others have been injured or tortured, including with electric shocks. According to Honduran human rights organizations, over one thousand people have been detained and many are facing criminal charges aimed at silencing dissent. Others have been victims of torture or had to flee for their lives. Security forces have entered neighborhoods, setting off teargas inside homes with children present, and seizing adults for arbitrary arrests. Prominent human rights and social movement leaders have been targeted with threats and defamation. Even the OAS recognized electoral fraud in the recent elections, but the US State Department is supporting Juan Orlando Hernandez’s violent attempt to hold onto power for a constitutionally-prohibited second term. I ask you to speak out against the brutal state repression of pro-democracy protesters in Honduras and do everything you can to suspend US aid to the Honduran regime. Our Latin America Liaison has accompanied COPINH (Council of Popular and Indigenous Organizations of Honduras) as they seek justice for the assassination of Indigenous and social movement leader Berta Cáceres, who was murdered March 2, 2016 in Honduras. 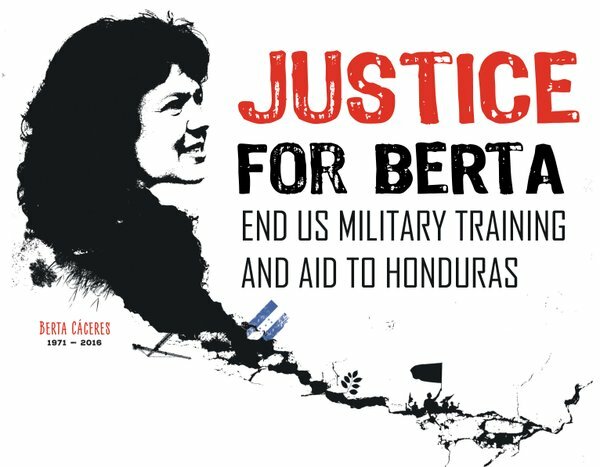 Our Advocacy Coordinator has engaged SOAW activists in supporting the first-ever bill to suspend U.S. military aid to Honduras, the Berta Cáceres Human Rights in Honduras Act (HR 1299). Ask your Representative to co-sponsor HR 1299 here. The Berta Cáceres Human Rights in Honduras Act is an important bill, and thanks to the work of numerous organizations and activists around the country, 60 Representatives have co-sponsored the bill. You can see who has co-sponsored here. If your representative is not yet a co-sponsor, e-mail him or her. You can also set up a meeting with your Representative, write a letter to the editor of your local paper, or organize a public event to educate others about HR 1299. Since the 2009 SOA-graduate led military coup in Honduras, there has been ongoing repression — including by the military and security forces — against social movement leaders, Indigenous leaders, environmental activists, journalists, lawyers, members of the LGBTQ community, and many others. The repression and criminalization continues today, as does US military training and funding. For more about the situation in Honduras, click here. Next → Next post: Join Hondurans in taking action this week to call for an end to US financing of the illegitimate regime in Honduras!